Smart Actuator and Sensor Technologies: Design, Modeling, Fabrication, and Control for Mechatronic Systems focuses on design, modeling, fabrication, and control of smart actuator technologies, such as piezoelectric actuators, electroactive polymer actuators, and a host of other “smart” material based actuators, including shape memory alloys, magnetostrictive materials and others. This book covers important technical aspects so that engineers, scientists, and designers can utilize the information in their work. 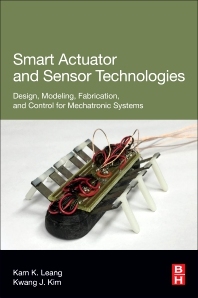 As emerging mechatronic systems, such as precision positioning system, soft robots, biomedical devices and aerospace system are exploring the use of smart actuators, this book provides complete coverage of the popular technologies. Dr. Kam K. Leang founded in July 2014 the Design, Automation, Robotics, and Control Lab - the research focus of the lab. The lab houses state-of the-art equipment for research in DARC activities. Some of the work focuses on design, modeling, and control of electroactive materials including piezoelectric ceramics, electroactive polymers, shape memory alloys, and a host of other materials that respond to electrical signals. More recently, projects in unmanned autonomous systems such as aerial robots is being conducted, focusing Applications of DARC research encompass micro- and nano-scale positioning systems (e.g., nanopositioners), scanning probe microscopes, and intelligent and bio-inspired autonomous systems. Kam Leang in collaboration with UNLV-lead team and other researchers receive new $3.8M NSF funding to work on electroactive polymer materials for soft robotics. His research interests are in a broad spectrum of “Energy Systems” and “Active Materials/Sensors.” He has authored/ co-authored more than 330(+) technical publications including 150(+) referred journal papers and 3 monographs and was awarded 2 U.S. patents. He is a recipient of the 2011 UNR Foundation Professorship, the 2006 UNR Lemelson Award for Innovation and Entrepreneurship, the 2002 Ralph E. Powe Junior Faculty Enhancement Award from Oak Ridge Associated Universities. He is a Fellow of ASME (2007) and currently serves on the editorial boards of Smart Materials and Structures (SMS), International Journal of Smart and Nano Materials (TSNM), International Journal of Advanced Robotic Systems, and Actuators.